Bellatrix, I'm a Pug! : What's in a color? Mom had always set out to get a black pug, in fact the only color that made sense for my name, was black. She looked and looked and everywhere she looked, it seemed she was greeted with a world of fawn. Don't get me wrong, we love us some fawn pug, but it begs to question....what's in a color? Let me take you back to when I was a wee little pug, I was only 3 months old and walking in the park. Well actually I was biting the leash, mom's jeans, playing tug with the leash, chewing on rocks...mostly making mom wish she had gotten a cat. While walking around the park, a woman happened by with a fawn and a black pug. She looked at me with mom's Uggs in my mouth and uttered, "that looks familiar!" Mom inquired and she stated that her black pug was crazy, wild and full of energy while her fawn one was lazy. This made my mom wonder...what did I get myself into? Skip ahead another month, we're in our first round of puppy school (yep that's right...first of many to come) and a woman knew a pug owner who also had a black and fawn combo. She too stated the black pug was way more active and crazy than her fawn. Once again mom cursed all those websites, and pug books she read that stated pugs were lazy and liked to dress up. So over my 7 months of life, I've met many a pug....from fawn to black, brindle and even albino. So I ask what color are you? Do you think you're lazy or crazy? Do you think it has anything to do with our colors...or is it our personality? Do you think it's in our gender? Or is it an age thing? For the record....I'm a black 7 month old hermaphroditic pug who likes to run, hates to dress up and can keep up with a whole pack of dogs 10 times bigger than me at my daycare. I'm 18.25 lbs of pug fury, that breaks the mold and then likes to eat the mold for dinner!! I'm as feisty as they come....care to share your stats? Well, according to my human I am 50% crazy, 50% lazy. I'm fawn and almost 2 years old. My human also says I haven't slowed down or sped up since I was 6 mos off age. For the record, I don't LIKE to be dressed up, but I'll do anything for a cookie. I'm not sure if spazziness is color-dependent. I do know a few crazy fawn pugs. And a few lazy black ones. Well Well Well Bellatrix, you bring some very good things for us all to ponder! The juxaposition of the same breed... two colors.. one is crazy, one lazy... the latter being me...I think could be a myth...an urban legend. Did you like my big juxy word? I am trying to impress my Stubby. He's Smart. I asked my Daddy what we should do about this. Are black puggies more crazzzy and fawn more lazzzzy??? Daddy knew exactly what to do! This is a question for MYTHBUSTERS!!! Maybe they will know!!! But we can speak in regards to my sister Izzy...She is fawn and She is CRAZY! Bella, I don't know if this will help you answer your question.....My sister & me are both fawn. She is totally lazy, but she's almost 11. I was a maniac when I was a puppy, Mom says. Now I'm about 75% lazy and still 25% craZY - like when we went to the beach I ran up and down the shoreline. Mom was always a fawn fan, but now we have met so many black pugs that she has changed her mind. #2 says our next pug will be a black one named Pickles. Mom says: fat chance. Hi Bellatrix! I was super spazy when I was your age. People that met me years later always commented on how they didn't think I'd ever calm down. I started to calm down when I was about 3 1/2. At 10, I became super calm and now at 12 calm is fast for me. I still like to play for about one minute at a time, but only on my terms. My parents think I'm lazy but I'm just a mature, goodlooking, fawn pug. Hiya Josie and gang. I'm super impressed with big words, I know Stubby will be smitten with it. I think our daddies must be brothers, my dad loves those Mythbusters guys. One of the highlights of his life was meeting one and chatting it up in front of an In-n-Out. I'm still not sure about this fawn vs. black pug debate....what about our brindle friends? Bellatrix - Wowwawoof! Your Daddy metta them??? Mine is going to be soooo jealous!!! I haven't put much thought to the brindle or even albino. You again bring raise a point. 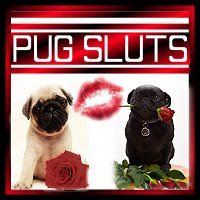 How 'bout this... All us puggies are the best and that's that! Josie....they say great minds think alike..and I like how you're thinking! My dad said he was very nice (Adam Savage), he was waiting to pick up some guys for a business dinner, but talked to my dad for a few minutes. The film in SF and I've seen the outside of the building! Mom, dad and I drove by on our way to a store. I wonder if they would take a picture with a FP? I think it would be Adams honor to take a picture with Flattie if he had the opportunity. I totally think he would. You may need to give him a giant cookie however! 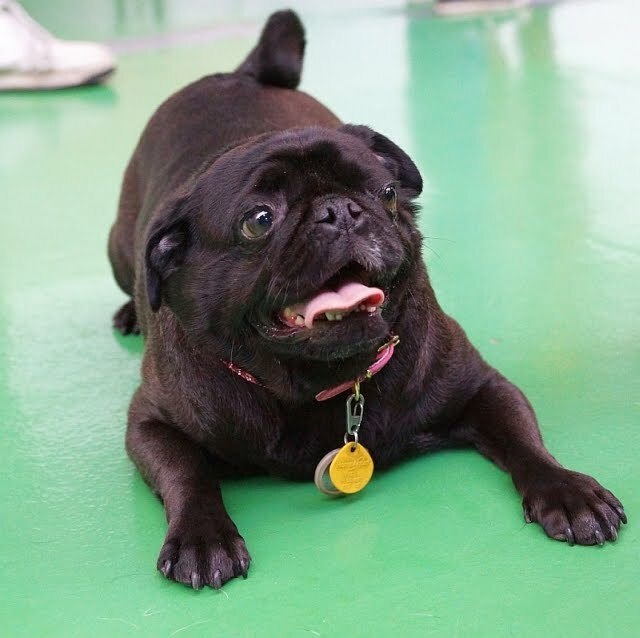 I'm a fawn pug and my humans think I'm pretty energetic. I really don't take naps, and when I do my little head pops up the minutes someone heads anywhere...kitchen, laundry room, bathroom, doesn't matter. Maybe its because I have a black stripe down my back??? I do have more black on me than a lot of the puggies I see at the dog park.